Geography of the Rigveda, with river names; the extent of the Swat and Cemetery H cultures are also indicated. The tribes mentioned in the Rigveda are described as semi-nomadic pastoralists. During the Rigvedic period, they formed a warrior society, engaging in endemic warfare and cattle raids ("gaviṣṭi") among themselves and against their enemies, the "Dasyu" or Dasa. When not on the move, they were subdivided into temporary tribal settlements (vish, viś) composed of several villages, and each village was composed of several families. These settlements were headed by a tribal chief (raja, rājan) assisted by warriors (kshatra) and a priestly caste (brahma). Anu is a Vedic Sanskrit term for one of the 5 major tribes in the Rigveda, RV 1.108.8, RV 8.10.5 (both times listed together with the Druhyu) and, much later also in the Mahabharata. In the late Vedic period, one of the Anu kings, King Anga, is mentioned as a "chakravartin" (AB 8.22). Ānava, the vrddhi derivation of Anu, is the name of a ruler in the Rigvedic account of the Battle of the Ten Kings (7.18.13) and at 8.4.1 with the Turvaśa (tribe). The meaning ánu "living, human" (Naighantu) cannot be substantiated for the Rigveda  and may have been derived from the tribal name. Bhalanas - The Bhalanas were one of the tribes that fought against Sudas in the Dasarajna battle. Some scholars have argued that the Bhalanas lived in Eastern Afghanistan Kabulistan, and that the Bolan Pass derives its name from the Bhalanas. Bharatas - The Bharatas are an Aryan tribe mentioned in the Rigveda, especially in Mandala 3 attributed to the Bharata sage Vishvamitra and in and Mandala 7. Bharatá is also used as a name of Agni (literally, "to be maintained", viz. the fire having to be kept alive by the care of men), and as a name of Rudra in RV 2.36.8. 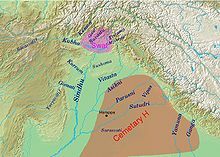 In one of the "river hymns" RV 3.33, the entire Bharata tribe is described as crossing over, with their chariots and wagons, at the confluence of the Vipash (Beas) and Shutudri (Satlej). Hymns by Vasistha in Mandala 7 (7.18 etc.) mention the Bharatas as the protagonists in the Battle of the Ten Kings, where they are on the winning side. They appear to have been successful in the early power-struggles between the various Aryan and non-Aryan tribes so that they continue to dominate in post-Rigvedic texts, and later in the (Epic) tradition, the Mahābhārata, the eponymous ancestor becomes Bharata Chakravartin, conqueror of 'all of India', and his tribe and kingdom is called Bhārata. "Bhārata" today is the official name of the Republic of India (see also Etymology of India). Parsu (Parśu) - The Parsus have been connected with the Persians This is based on the evidence of an Assyrian inscription from 844 BC referring to the Persians as Parshu, and the Behistun Inscription of Darius I of Persia referring to Parsa as the home of the Persians. Tritsu The Tritsus are a sub-group of the Puru who are distinct from the Bharatas mentioned in Mandala 7 of the Rigveda (in hymns 18, 33 and 83). Under king Sudas they defeated the confederation of ten kings with the help of the Bharatas at the Battle of the Ten Kings. ^ Staal, F. (1999). Greek and Vedic geometry. Journal of Indian Philosophy, 27(1), 105-127. ^ Sharma, R. K. (1997). Rural Sociology. Atlantic Publishers & Dist. ^ a b c d e A. A. Macdonell and A. B. Keith (1912). Vedic Index of Names and Subjects. ^ a b Talageri, S. G. (2005). The Rigveda as a source of Indo-European history. The Indo-Aryan Controversy: Evidence and Inference in Indian History, 332. ^ Bloomfield, M. (1899). The Myth of Purūravas, Urvaçī, and Âyu. Journal of the American Oriental Society, 20, 180-183. ^ Zimmer, S. (1986). On a special meaning of jána- in the Rgveda. Indo-Iranian Journal, 29(2), 109-115. ^ a b Frawley, D. (2001). 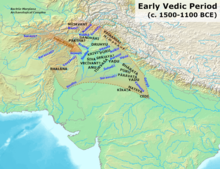 The Rig Veda and the History of India: Rig Veda Bharata Itihasa. Aditya Prakashan. ^ Weller, H. (1937). WHO WERE THE BHRIGUIDS?. Annals of the Bhandarkar Oriental Research Institute, 18(3), 296-302. ^ MALVIYA, C. (2011). THE ROOTS OF DEMOCRACY IN INDIAN CULTURE. CULTURAL IDENTITY, 287. ^ a b Sircar, D. C. (1974). The Dasa–Dasyu in the Rigveda. Some problems of Indian history and culture. ^ Geiger, W., & Sanjana, D. D. P. (1885). Civilization of the Eastern Irānians in Ancient Times: Ethnography and social life (Vol. 1). Henry Frowde. ^ Hopkins, E. W. (1893). Problematic passages in the Rig-Veda. Journal of the American Oriental Society, 15, 252-283. ^ Warraich, M. T. A. GANDHARA: AN APPRAISAL OF ITS MEANINGS AND HISTORY. ^ Grassmann, H. (Ed.). (1876). Rig-veda (Vol. 1). FA Brockhaus. ^ PINCOTT, F. ART. XIX.—The First Mandala of the Rig-Veda. By. Journal of the Boy. Asiat. Son, 16(Part II). ^ Pike, A. (1992). Indo-Aryan Deities and Worship as Contained in the Rig-Veda. Kessinger Pub. ^ Rig-Veda-Sanhitá: A collection of ancient Hindu hymns... Vol. 3. 1857. ^ Perry, E. D. (1885). Indra in the Rig-Veda. Journal of the American Oriental Society, 11, 117-208. ^ Griffith, R. T. (2009). The Rig-Veda. The Rig Veda. ^ Witzel, M. (1999). Aryan and Non-Aryan names in Vedic India. Data for the linguistic situation, c. 1900–500 BC. Aryan and Non-Aryan in South Asia, Evidence, Interpretation and Ideology. Cambridge Mass. : Harvard University (Harvard Oriental Series: Opera Minora III). ^ Muller, F. M. (1869). Rig-veda-sanhita (Vol. 1). ^ Radhakumud Mookerji (1988). Chandragupta Maurya and His Times (p. 23). Motilal Banarsidass Publ. ISBN 81-208-0405-8. Pargiter, F.E. 1979. Ancient Indian Historical Tradition. New Delhi: Cosmo. Talageri, Shrikant: The Rigveda: A Historical Analysis 2000, ISBN 81-7742-010-0 ; --Aryan Invasion Theory and Indian Nationalism. 1993. - Source texts of ancient Greek and Roman authors. - Strabo's work The Geography (Geographica). Book 15, Chapter 1 (sections 1-25, 26-38, 39-73), are about India.